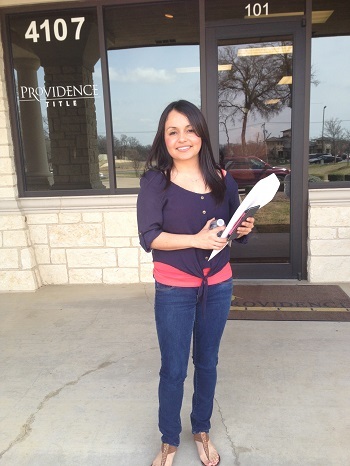 Homebuyer Linda celebrates the closing of the purchase of her new home. Providence Title served as a key partner throughout TCHP's administration of the Neighborhood Stabilization Program. Tarrant County Housing Partnership recently concluded a state-funded neighborhood stabilization program that resulted in nearly $247,000 in down payment assistance provided to low and moderate income homebuyers. The down payment grants were applied towards the purchase of homes that TCHP rehabilitated in more than a dozen neighborhoods in communities across Tarrant County, including Fort Worth, Arlington and North Richland Hills. In many cases, the rehabilitated properties were in danger of falling into disrepair or blight. Susana Perez, a housing advisor for TCHP, said that many of the community members who participated in the program were first-time or first-generation homeowners. "What made this program particularly exciting was the amount of assistance that we were able to offer," Perez explained. "The homebuyers we worked with received as much as $30,000 in assistance. Most of the buyers are parents who work jobs where they earn modest wages, or they're older and live on a fixed income. Without this type of program, they would have struggled for years to save enough money to own a home, probably without ever reaching their goal." Added Gaby Rosas of Ultima Real Estate, another Neighborhood Stabilization Program collaborator, 'It was exciting to be able to work with clients on this program. Many of them were first-generation homebuyers, and the neighborhood stabilization program was a once-in-a-lifetime opportunity for them to realize their dreams. "The staff at TCHP were so helpful and informative during this process," she went on. "We always welcome the opportunity to partner with them." Learn more about homebuyer assistance.